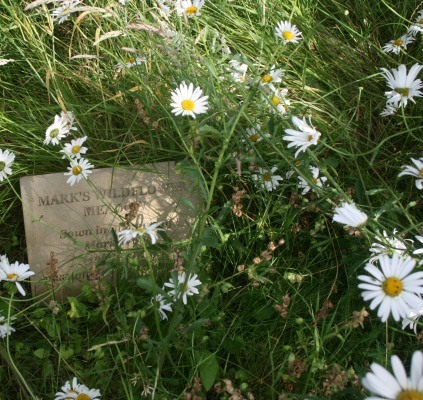 Mark’s wildflower meadow at the bottom of the garden is named after a young man who died last year under tragic circumstances. The Prime Minister admitted the government were wrong to cut his benefits. And Atos, the company in charge of assessing whether a lot of vulnerable people like Mark should return to work or not, have lost their government contract because of the way they have mishandled cases. 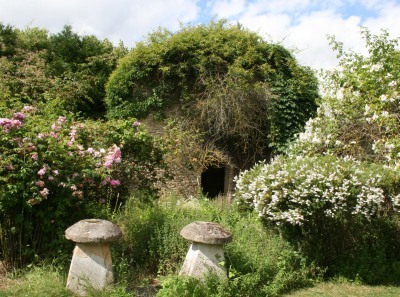 I see from the St Ethelwold’s Blog that Mark loved nature, and the garden. 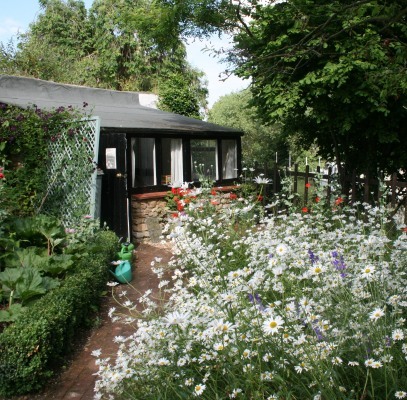 He even had an art exhibition in the Garden Room in 2005. 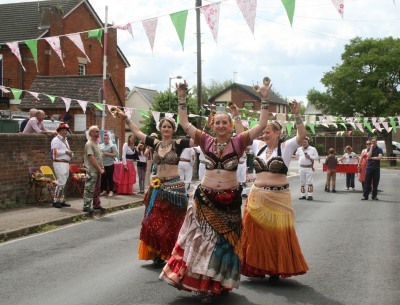 Street parties are a good way to meet your neighbours and build community spirit, and Exbourne Road started doing Street Parties back in 2011, and 29th June 2014 was their fourth year. Normally, Exbourne Road has cars parked down both sides, but the road closure meant that it looked as it did in the 1950s. Back then the children could play in the street: football, cricket with painted stumps on a wall, British Bulldog, and Roller Skating in the Prince of Wales Carpark. 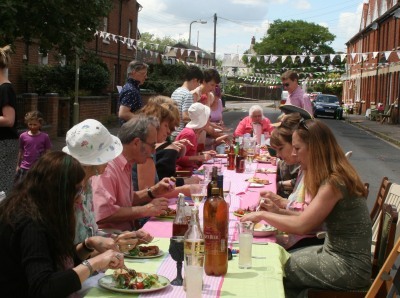 Bunting is of course essential for a Street Party. For the four hours the road was closed there was lots going on. Ashnah performed. 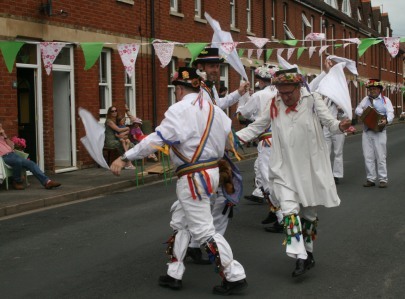 As did Mr Hemmings Traditional Morris Dancers. There was a bun throwing competition, and other sports, and A Naffle: that is where all the prizes are naff but you must take them home. Then there was Guess Who? 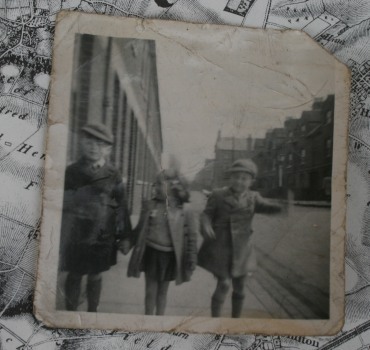 Numbered pictures showed the residents as young children. 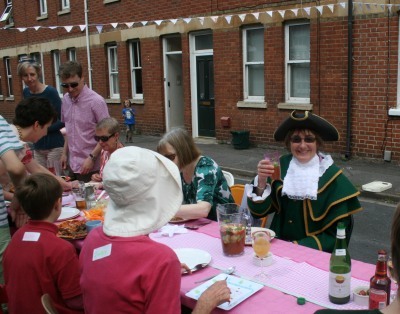 Thanks to Clare for the invitation, and also Lucy, Matthew, Harry, and Penny who did a lot of the organising. Archaeological digs happened there for 11 years ending in 2011. The excavations revealed the foundations of Roman buildings including a circular arena. There were also many Iron Age pits. During that time a lot of artifacts were collected. The current work called Trendles Project, funded by the National Lottery, involves experts leading, and enabling local people, and school children, to help and sort and categorise a lot of the finds: Iron Age and Roman pots and bones and coins etc. 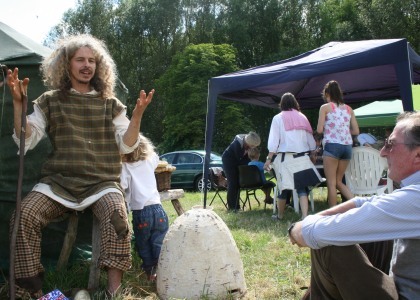 The open day involved archaeological talks by the project director, and story telling by Chris the Celt who is telling here about how the first harp was made. 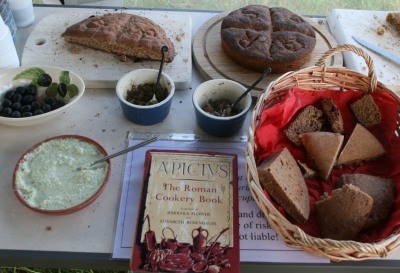 There were samples of Roman Food prepared with the help of Apicius’ Roman Cookery Book; demonstrations of various ancient arts and crafts including basket making, pottery, and spinning; and the chance to view and help sift through some of the artifacts that had been found. 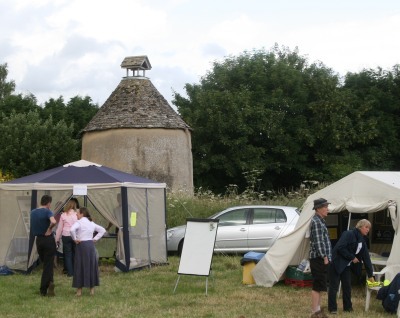 Before cycling back to Abingdon I viewed a couple more Marcham dovecotes: one shown me by the owner of Manor Farm, who is a great supporter of the archaeological work, and follow up project, on his land. 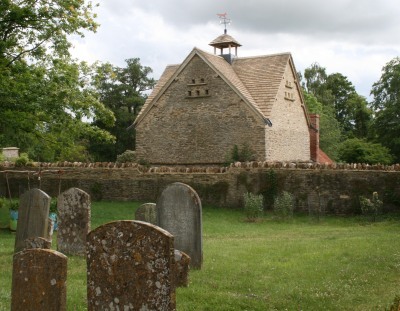 The other dovecote is next to Marcham parish Church and has been fully restored. Marcham had several dovecotes. The first ones would have been built when the Manor was owned by Abingdon Abbey – when pigeons were a source of winter meat, allowed to the privileged. 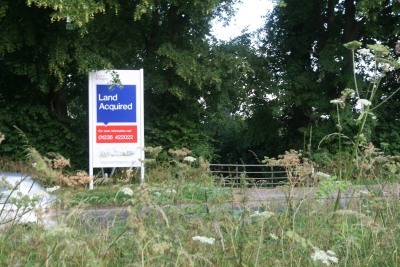 Plans for 159 dwellings in a field off the Drayton Road have been resubmitted by the new owners Taylor Wimpey. The target decision date put by the district council is 30th November 2014. Plans available here. The new developers have introduced a modified style of housing, and drainage, but draw on the same transport study done on 6th September 2012 by their predecessor. A planning inspector, on appeal, allowed the original plans so long as a number of conditions were fulfilled. The most significant of these were traffic mitigation measures. The original developers traffic study saw queues of 70+ during the morning rush hour on Drayton Road at the double roundabout. Their solution was to remove one pedestrian crossing and add two pedestrian crossings at new locations. 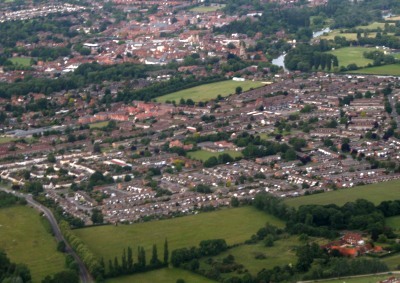 That measure was then rejected by Oxfordshire County Council – the authority required to approve any highway changes. The lease is up at the end of June for both the Town Council and The Citizens Advice Bureau at Old Abbey House. The new buyer is not yet known but rumours include: pub, arts centre, hotel, mosque, housing …. 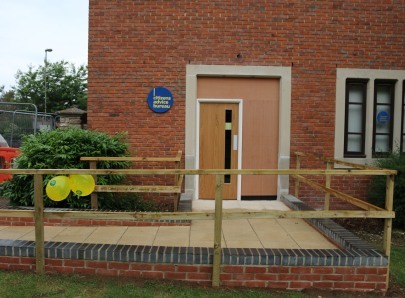 And so the address for the Abingdon & District Citizens Advice Bureau (CAB) is now Abbey House, Abbey Close, and CAB balloons are out. Abbey House, in Abbey Close, also has new signs for Oxfordshire County Council, the other new tenant. 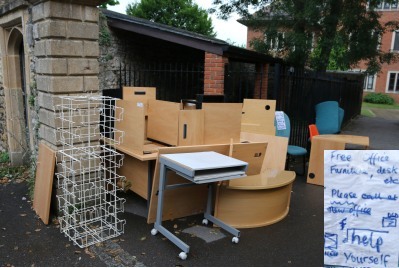 Outside Old Abbey House there is some office equipment, available for Free. It includes cages for displaying information leaflets, a reception desk, and some chairs. 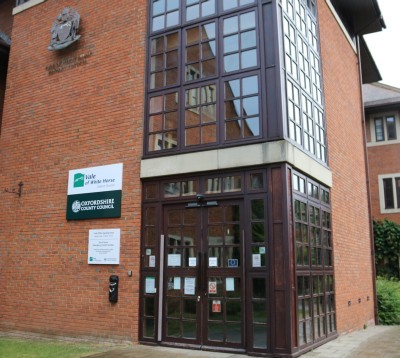 Abingdon-on-Thames Town Council have also vacated this building to move to the Guildhall.